Matthew 2:19 says "But when Herod was dead, behold, an angel of the Lord appeareth in a dream to Joseph in Egypt." I must call attention to this. We are told that THE angel of the Lord appeared to Jacob at Peniel in Genesis 32. Here it is AN angel of the Lord. THE angel of the Lord according to many of the Early Fathers of the Church was the pre-incarnate Christ. Now here in Matthew we see the incarnate Christ down in Egypt. "Arise, and take the young child and his mother, and go into the land of Israel: for they are dead which sought the young child's life"
It is essential to get Jesus out of the land of Egypt and back up into Israel. The most important reason is that He has been born under the Law, and He is to live under the Mosaic Law. He, besides Mary, is the only Man who really ever kept it. He must get out of the influence of Eygpt. He is not to be raised down there as Moses had been and as the children of Israel had been when they were becoming a nation down in Egypt. By the way, Archelaus is one of three brother who were all called Herod. This son was of the same cruel, heartless bloody disposition as his father. History records the fact that at one Passover he condemned three thousand people to death and had them slain in the temple and the temple area. The Hebrew word for Nazareth was Netzer, meaning a branch or a shoot. The city of Nazareth was so called because of its insignificance. the prophecies of Isaiah 11:1; 53:2-3; and Psalms 22:6 are involved in the term Nazarene. But the Lord Jesus was given that term not only because He was a root out of the stem of Jesse, but because he grew up in the city of Nazareth, and He was called a Nazarene, which fulfilled the prophecies. Nazareth was Jesus' home until he entered into His public ministry. It was Nazareth were He grew to manhood. Nazareth was a small town in Galilee, located west of Capernaum. It was not far from Canan where Jesus wrought his first miracle by changing water into wine at the marriage feast. The site where the city of Nazareth now stands has not changed, materially, in the passing of the centuries. On the western slope of the valley there is now a modern town. Higher up on the hill, limestone cliffs are visible. These cliffs are about forty feet high and are believed to be the precipice over which the angry mob attempted to cast Jesus, as recorded in Saint Luke's gospel. The valley around Nazareth is green and fertile. Fruit trees abound, and the countryside is extremely beautiful. One can see Mt. Tabor, Carmel, and the blue Mediterranean Sea. On the north, in the far distance, the snow capped Mount Hermon is visible. Yet as is so often true, the people who live in the midst of theses beauties of nature and gaze upon the magnificence placed there by a loving God, are as ungodly, violent, rude, and wicked as they were in the day's of Christ's earthly ministry. That is why Nathanael asked, "Can there any good thing come out of Nazareth?" The People of Galilee were, in general, looked upon with contempt by the people of Judaea. Yet in the town of Nazareth lived Joseph the step father of our Lord, and Mary, the woman, the New Eve, the one that was so honored of God, and God's only begotten Son, Jesus! It was in Nazareth that Jesus increased in wisdom and stature, and in favor with God and Man. He returned from Egypt as a little Child. 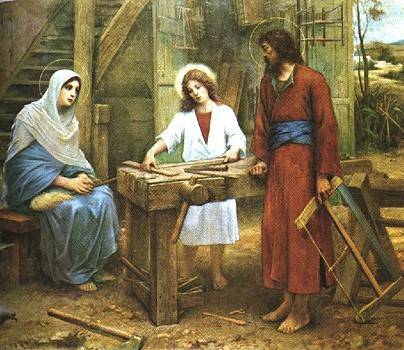 He grew , through boyhood into manhood in Joseph's carpenter shop. It was from the wicked rough town of Nazareth that he stepped forth, to offer peace to all who would come to Him by faith believing. He was the consolation of Israel, the Saviour of the "whosoever wills"
Now we have seen all four prophecies dealing with locations in the birth of Christ: born in Bethlehem, called out of Egypt,weeping in Rama, and called a Nazarene were fulfilled in a very normal way. He touched base in all of these places, and what seemed rather strange prophecies became very sane realities.